Orchestral Manoeuvres In The Dark. The Human League. Ultravox. Heaven 17. 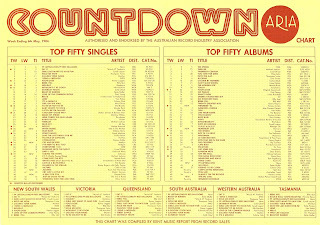 Since the start of the decade, synthpop bands had flooded out of the UK and onto the Australian singles chart. By 1984, there was a growing list of homegrown electronic groups to compete with them. 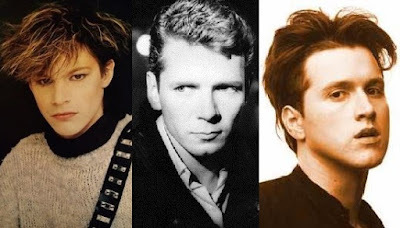 This week in 1984, three of the most successful Australian synthpop bands of the decade all debuted on the ARIA chart with their latest singles - and although none of them made the top 10, they all demonstrated that local acts had what it took to rival the best of the British. A piece of German synthpop was at number 1 in Australia this week in 1984. "99 Luftballons/99 Red Balloons" stayed on top for a fifth and final week. Last seen on the top 100 with the excellent "Star" from 1981, Kiki Dee returned with what seems to have been a one-off single for EMI, which was produced by old pal Elton John. This remake of the 1961 single by country performer Don Gibson peaked at exactly the same position as Leo Sayer's previous release from the Have You Ever Been In Love album. From the third of three albums the multi-genre artist released in 1983, this country track would be BJ Thomas's final appearance on the Australian chart. Four years later, he'd perform one of the best TV theme songs ever. The Pseudo Echo story so far had been what every band dreams of, but now came the Melbourne four-piece's first big test - could they land a second hit? The answer: yes, they could. Another piece of catchy synthpop that sounded as good as anything coming from overseas, "A Beat For You" established that Molly Meldrum's instincts had been right and gave Pseudo Echo a second top 20 hit. Their debut album, Autumnal Park, also peaked just outside the top 10 when it was released in June, although, as we'll see in coming months, its third and fourth singles missed the top 50. Despite a string of US hits dating back to the early '70s, funk band Kool & The Gang had never really taken off in Australia. Even seminal party tune "Celebration" had only reached number 33. Only their second ever top 50 appearance came from ballad "Joanna", which probably owed its local success to the fact that it'd been a number 2 hit in both the US and the UK. Although the love song wasn't typical of Kool & The Gang's output, its chart appearance here foreshadowed the fact that the band would finally score their breakthrough hit in Australia with another sentimental single in 1985. This Australian band had been at the forefront of the local synthpop movement, reaching the top 10 with debut single "Can't Help Myself" (as Flowers) in 1980. A name change and several hits later, and Icehouse were up to their third album, Sidewalk. Lead single "Taking The Town" was not quite as synth-y as previous singles but wasn't exactly pub rock, either. It also wasn't as big a hit as Icehouse were probably expecting from the album's first release - a situation that didn't change with the subsequent singles from Sidewalk. How quickly things can change. Marilyn had made a huge splash at the start of 1984 - both on the ARIA chart with the effervescent "Calling Your Name" and in person when he came to Australia for a headline-grabbing promo tour. Seemed like we had a big new star on our hands. But then he went all serious, releasing gospel-tinged ballad "Cry And Be Free" as his second single. A minor hit that was in and out of the top 40 in seven weeks, the track seemed like a misstep - even Marilyn's pals Culture Club had waited until they had a few big singles under their belt before releasing the equally dramatic "Victims". Things didn't get any better for Marilyn, who didn't end up releasing his debut album until 1985, when he made his final appearance on the singles chart. Our final Aussie synthpop band - and highest newcomers - for the week were, like Pseudo Echo, following up a hit debut single. 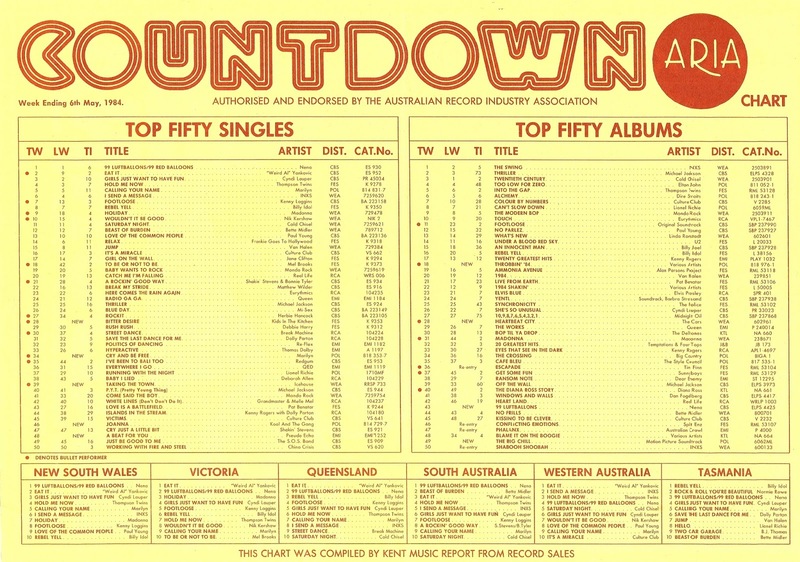 And Kids In The Kitchen returned to the top 20 with second release "Bitter Desire". Quite a different style of song to the punchy pop of "A Beat For You", "Bitter Desire" is a moody piece of synthpop that builds to the explosion of brass towards the end. It would be a full year before KITK would return - with an altered line-up - with single number three. Unlike Marilyn, they were able to sustain interest until their debut album finally saw the light of day shortly after. Next week: epic ballads from two of the most successful male artists of recent years, plus a former flop gets a new lease of life... with a little help from Countdown. The Kiki Dee song is better than I was expecting, but still sounds slightly dated for 1984, and almost early Depeche Mode-ish, music-wise. I loved 'A Beat for You' - the only song of this week's entries I was aware of at the time - and am surprised it wasn't at least a top 10 hit. I uploaded a better copy here - https://www.youtube.com/watch?v=5LgGAg80Ckc . Excellent song A Beat for you. I love Pseudo Echo, Funky Town was played so often as a kid. Downloaded the extended version for both songs. I'll give the other songs a shot when I return to Sydney from Newcastle later today, too much data streaming without wifi lol. I like Marilyn's Calling your Name so I'll see how this one sounds.